It’s the first day of Spring and we’re watching temperatures rise higher and higher. We can’t wait to get out on the water, but before we drop our Catalina 22, there are a few things we need to do to get it ready. Since we have a checklist we go through every year, we thought we’d share our checklist with you. Clean the hulls and deck, make sure everything still looks in good condition. Looks for cracks or scratches that weren’t there in the fall. Check all the joints between the hull and deck. Make sure registration is current and on board. Check for leaks around the entire boat. Inspect cleats, clean winches. You’ll also want to get the life jackets back on board, along with the First Aid supplies, the bailer and the hand pump. Make sure batteries are changed. Inspect wiring and chafe. All lighting fixtures and navigation lights both above and below deck should be working order. Look at antennas and replace batteries in the radio. Check belts, transmission fluid, oil and fuel so that all are full, clean and running properly. Inspect the blige, propeller, spark plugs, safety chains and lubricate the winch. 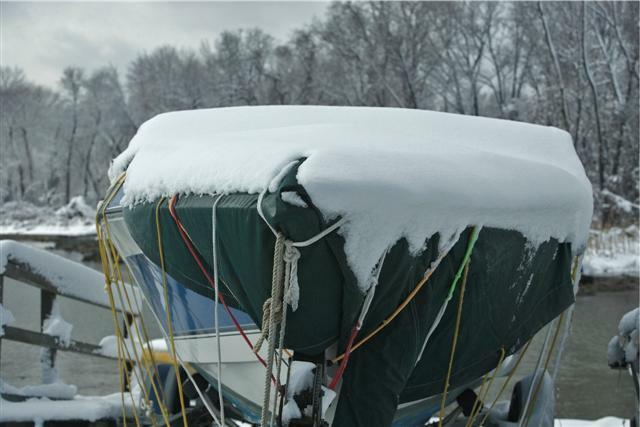 Look over general conditions (hopefully you stored it in a safe dry place during the winter). Look for any wearing, chafing or tears.